Ezy-Axis deer call creates the sound of Axis buck screaming. The scream represents a bucks dominance, location, and willingness to fight or breed. Every axis hunter should carry the Ezy-Axis deer call to help increase hunting success rate. Ezy-Axis deer call has redefined Axis hunting. Why go after Axis deer when the deer can be drawn to the hunter? After years of field work, Ezy-Axis is proud to present the world’s first axis deer call that attracts axis deer into close range, out of heavy brush, and capable to stop a buck in his tracks to present a shot. The axis deer call creates new and never experienced way to hunt the species. It’s far more exciting to get out of the blind and call a buck in face to face opposed to waiting for him to come into the corn feeder. Far too long these animal have been getting away with no actual call to tap into their vocabulary, well here it is! Axis deer are not native to Texas, but who cares because they are here to stay with growing numbers. The deer are tastier than whitetail and sportier to hunt. A mature buck can weigh up to 200+ lbs. and their spotted hides can’t be beat. Axis deer have very unique characteristics and share some of the same that compare to elk crossed with whitetail deer in so many ways. 70% of axis does are offset from whitetail in which they come into breeding season during summer months starting in May and can run through August. The other 30% come into heat from October to March. Giving the hunters a YEAR round rut. 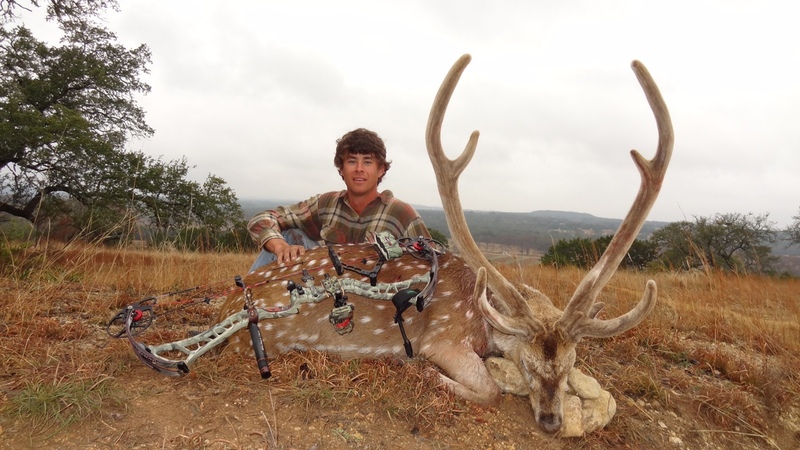 Axis bucks drop antlers year round due to their mothers breeding cycle. 70% of bucks rub out of velvet in April and begin rutting from there on out. A dominate buck will roam for miles cruising for does in heat. They will then breed the does and fight off all opposing bucks. There will be satellite bucks surrounding the harem and all breeding bucks will scream showing they want to breed or fight. EZy-Axis has proven if you scream like axis buck they will come to play. The Ezy-Axis calls works best with rattling horns and a cow horn. Mature axis bucks scream IN BURSTS OF ONE TO THREE SCREAMS. Young bucks scream in burst of five screams and a lot more frequently. Bucks scream after getting up from bedding, often will scream every 30 minutes after showing other deer in area where they are located. The scream shows dominance and a willing heart to fight, so when using the call be aware you could have a buck coming to fight. NEW - The "Lidd'le Beeper" EZY-AXIS Axis Doe caller. Eric Harrison owner of Ezy-Axis. I have guided hundreds of successful axis hunts in the traditional ways of hunting over a corn and protein feeder. I started hunting elk in Oregon several years ago and witnessed a strong resemblance in Axis and elk. It became my mission to develop a call and enter the axis herd’s vocabulary. I’m very proud to present the axis deer call Ezy-Axis, it will help to kill. Ezy-Axis was created to give axis hunters the tools needed to specialize in hunting axis deer.